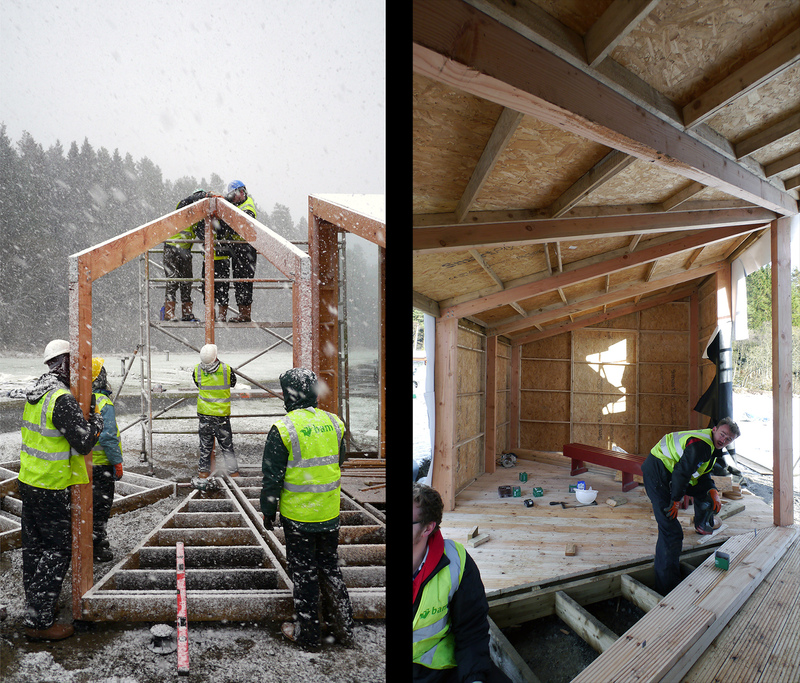 The Kielder Warm Room is a permanent live build project designed and constructed by seven Master of Architecture Students. Situated in Kielder Village, Northumberland, UK. 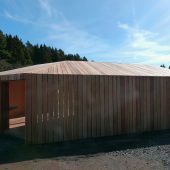 The project was developed in partnership with the Kielder Water and Forest Park Trust, Kielder Art & Architecture, The Forestry Commission and the Kielder Village community. The brief for the project developed from a need to support the local community-owned campsite and overnight ‘Star Camps’ which are both vital to the economic sustainability of the Village. Design proposals were drawn up by the students and then developed with the community. 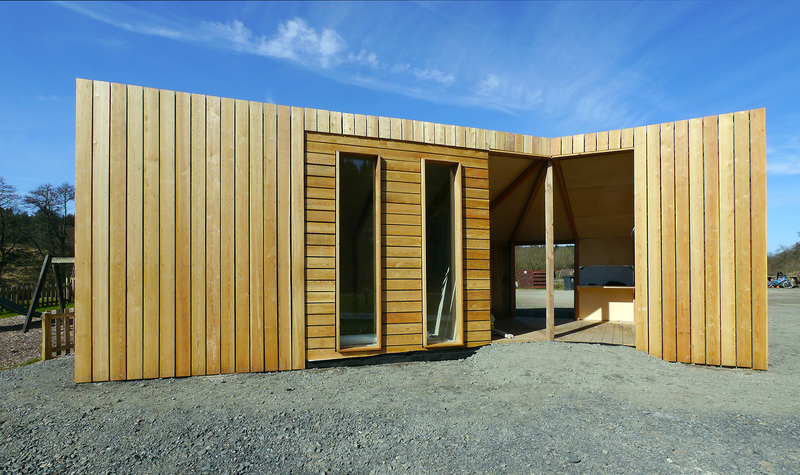 The timber-framed Warm Room is clad with larch and lined with birch plywood with 3m windows allowing wonderful views of the Kielder landscape and sky. The well-sealed and insulated construction means that the space can be heated by solar gain, occupants and light fittings without the need for additional energy inputs. 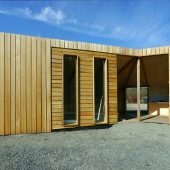 It provides a much-needed sheltered space and equipment charging point for stargazers who participate in overnight star camps as well as a venue for community meetings, educational events and stargazing seminars. 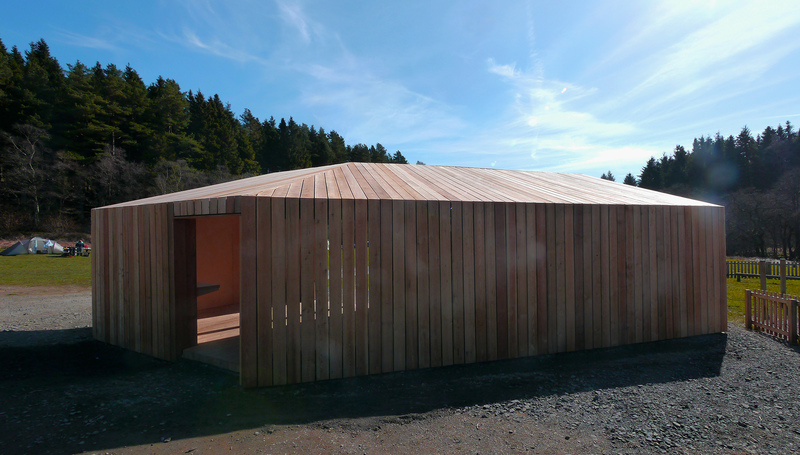 The structure also incorporates a sheltered external cooking area for use by campers. Client: Kielder Water and Forest Park Trust, Kielder Art & Architecture, The Forestry Commission and the Kielder Village community. Research Question: ‘Testing Ground’ is an ongoing research and teaching project established in 2012 by the School of Architecture, Planning & Landscape, Newcastle University and the Kielder Art & Architecture programme. 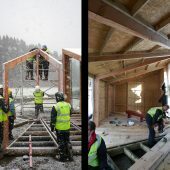 Testing Ground is seeking a long-term understanding of small-scale, locally generated variants of built environment sustainability and is aiming to ground live build pedagogy within a consideration of the broader ecology of the building process, by using locally sourced materials, or reusing or recycling locally available resources where possible. Testing Ground is also aiming to explore social sustainability, by working directly with communities in participatory ways, using local expertise or providing local training opportunities whilst also adding a direct social and economic benefit to remote rural communities. Testing Ground is run as a ‘Linked Research’ module under the supervision of Professor Graham Farmer and Peter Sharpe, Curator of the Kielder Art and Architecture Programme.